Would you pay $6 on your Clipper card for a Muni ride? If you were thinking the Cable Cars, that's not correct, conductors only accepts passes and not e-cash. Something really weird is going on where some people on Twitter have complained they were charged $6 on e-cash for their Muni ride. One passenger was able to provide proof by taking a snapshot and uploading it (click here to see). For the tweets: Tweet #1, tweet #2, tweet #3. Reading the tweets from the person who snapped the photo, she was able to contact Clipper for an appropriate refund for the overcharge. This is very odd. Other than Cable Cars, there's no such thing as a $6 fare on Muni. 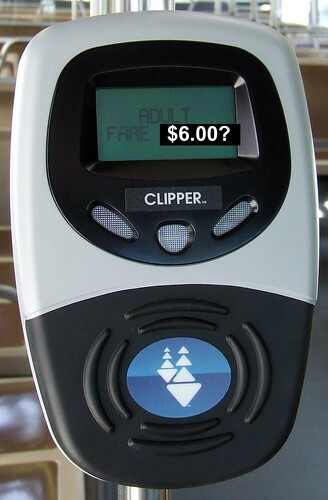 Is there an explanation from a Clipper or MTC representative of why the card reader was programmed to accept a $6 fare? Muni operators aren't supposed to mess with the driver's console, other than pressing the on/off switch when it's malfunctioning. On the other hand, if this was a widespread error, this can happen when Clipper's server sends an inappropriate update to all consoles within the Muni system. All buses & trains in the yard would receive it overnight and all the hardwired readers would also get it too. If you rode Muni this week, I highly suggest you take a look on your Clippercard.com account and review your ride history. Demand a refund if you were overcharged. They're about to implement the hand-held readers that can deduct money sometime by the end of the month, maybe that's why? No, it's not that. That photo from that twitter user shows it on a Muni vehicle, which it's not supposed to do. Only Cable Cars charges $6 fares, there's no such other fare on metro or buses. Muni rides used to consistently say MTANONE in my trip record but lately more route numbers have shown up so could be a unit that was misconfigured for a cable car route #. I get overcharged like this on VTA because some express 103 buses are used for route 89 so i get charged $2 despite having a 3 zone caltrain monthly pass. When this happens the unit doesn't report it took ecash or display a new ecash balance. It shows the pass expiration date (which it uses to reduce the $4 express fare to $2). The apathetic clipper phone people refuse to credit and claim they can't see the route #s in their system even though i can in the online trip records. Hey Akit, I'm @iamfacemelter (Tweet #1) in this post! So I just checked my card activity on clippercard.com, and the route listed for my $6 charge is 'CC59' which I'm assuming is the cable car rate. However, I was most certainly on the 31 Outbound when this happened. I am noticing more recently that I've been charged only $1.75 for some of my bus rides. It's random, twice I was charged only $1.75 on a Sunday Muni Bus ride, and once on a Monday Muni Bus ride. Could this be SFMTA's attempt at giving me a refund on my $6 bus fare in 25 cent increments? You should be calling Clipper for that major over charge. The only reason why you can get a 25 cent discount is when you transfer from BART to Muni within 1 hour, and a ride from Muni to BART within 24 hours of exiting BART (a savings of 50 cents).